← Ethereal Canyon – who thinks up these names! 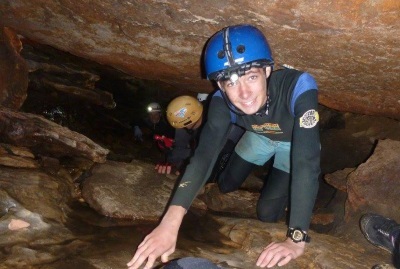 I had mentioned to a friend (that I went to school with in the dark ages) that I would maybe take him canyoning one day. None of the people I went to school with have a clue as to what I get up to! Anyway, Steve contacted me and said “when are we going to do it” so I thought, better do it before it gets much colder, and while he’s still keen! So, I suggested to my Grandson Bailey that he might like to come along (and his sister Teagan and partner Joel, but they got geographically challenged and were a no show), and put it out for BWOC members. I got one member and one visitor … what’s the world coming to, this used to be a “must do” trip! We all met up on Sunday morning at the Galah Mountain Road turnoff – intending to do the classic Twister and Rocky Creek trip, but unfortunately while I was waiting there a convoy of 4wd vehicles drove past. I flagged down the last one and asked how many in the group and was told 25! Far out, I had no intention of taking my small group through Twister/Rocky on such a cold day with the potential to get held up behind 25, so I went to Plan B! and decided that I would take them to Deep Pass, then over to The Slot and then, if they were up for it I’d take them through the small cave under The Slot. This really wouldn’t rate a mention on this Blog, but Bailey was along for the ride, plus Steve, he may never do something this adventurous again and I had Denise there to help me out. 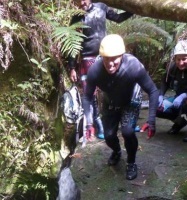 We set off for Deep Pass and made it down the (much eroded track) in no time at all, we wet-suited up and I sent them off ahead. 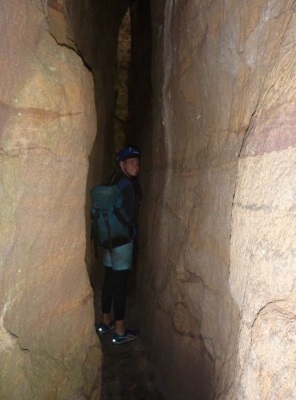 Anyone can lead a group through a canyon like Deep Pass but really, you should just stand back and let them lead you through, they get much more out of the trip than blindly following the leader! In days gone by, Deep Pass used to be much more fun, but over the years people have put enhancements in so that the canyon can almost be done without wetting your feet (ie it can be done in winter). 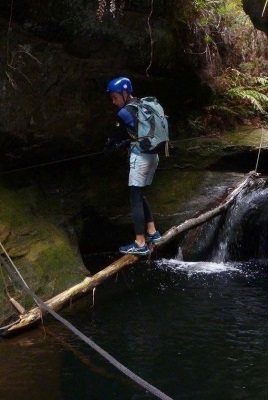 It’s taken a lot of the adventure out of it, but I’m sure it was done so that Cubs, Scouts and young kids could do the canyon, personally don’t agree with all the logs/ropes/slings etc, but what can you do. 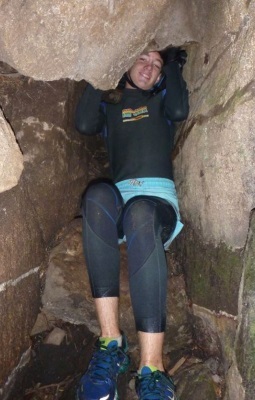 It’s been a few years since I was in Deep Pass and so couldn’t remember which pools we jumped and which we didn’t. So, we came to the first pool and I was the crash test dummy, climbed down to it and got in the water and felt around, they all watched me (they were nice and dry), but I decided that there were too many obstacles for it to be done safely so we went on to the next pool. This one was fine, so we slid down into it and then climbed up and around and did it again (there’s two ways you can slide), everyone had a ball with this, and then the next slide by now they’re getting the hang of it. Eventually we came to the Big Jump. I showed them all where to jump from, fully intending to climb down myself and not jump, after all, I’ve done it before and am maybe too old to do that stuff, but I don’t know something got into me and next thing you know I was jumping off the waterfall myself, it must be about 10m or so, who knows but it’s a buzz. 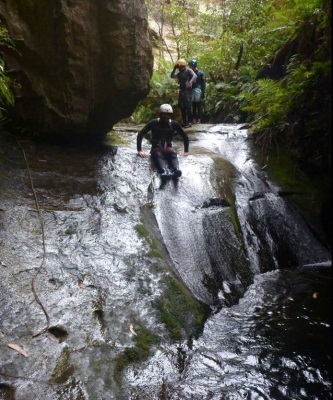 At the next jump, both Bailey and I decided we were wet enough so did the climb down while the others jumped. In no time at all we’d exited the canyon and were over at the Deep Pass camp site (lots of tents around), we had some lunch and then made our way over to The Slot. This is a pagoda that looks as though it has been cleaved in three, down the middle and then another slot perpendicular to that. It had been a while so I wasn’t sure how to get in but we finally found the route up and were in the slot, lots of oohs and ahhs. We explored to the end that you can’t get off and up and then walked back (past the slot we’d come in via) and exited down to the end, there’s a nasty squeezy rock jam that you have to negotiate past, lots of fun. We then walked around to The Cave, this actually has a tag on it so is a recognised cave and when I came home I did a Google on it and it goes much further than I was willing to go, maybe some day with some experienced cavers and not a bunch of newbies that I had on this day (and felt responsible for – what if we got lost in the cave!). So, we walked down to where the small watercourse exits from the cave and made our way in. It was pretty squeezy and I let the others find the route up, making sure that they didn’t go too far and then told them to find their way out. It was a real adventure for them, particularly Steve, not sure that he knows what to make of me now! Too soon we were making our way out of the cave and back through the slot. We walked out via the tourist track and did a side trip up to a big pagoda that gives a view over Deep Pass (an aboriginal trade route). It’s spectacular country and I felt good that I could show them places that they wouldn’t even have known existed. 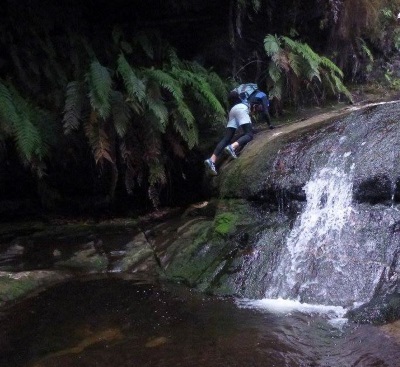 This entry was posted in Bushwalking, BWOC, Canyoning, Caving, Family. Bookmark the permalink. Marilyn you are a complete Legend! You make the City To Surf look like a stroll in the park! Good on you kiddo my mum would be so proud of you! Not a legend, there are heaps of people doing this sort of stuff, I’m sure! Having said that, probably wouldn’t be doing this if I hadn’t first done City to Surf! Yep, reckon your Mum would be proud, I would have loved to have known her when she was bushwalking.